Successfully Added Car Multimedia + DVD Player - Double DIN 7 Inch TFT Touchscreen to your Shopping Cart. 2-DIN sized vehicle multi-media player with 7 inch TFT touch screen for easily playing all of your favorite media; including CD's, DVD's, DVB-T, digital music and video files on an SD card or disc, and FM radio. This model car multi media + DVD player features a motorized screen open/close function, excellent compatibility with many digital formats and disks, and a fully interactive Bluetooth connection manager for both making and receiving calls through the stereo system. In these tough economic times, why not save some money by staying home and doing some work on your car during your next holiday? Upgrading your car is a great way to give yourself long-term pleasure and peace of mind, and you will enjoy this car multimedia player much longer than any trip you would have taken to some crowded and overpriced tourist trap. 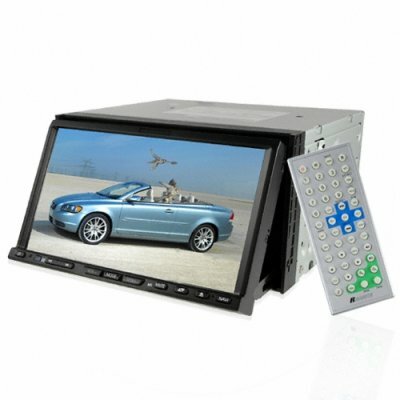 A great wholesale price makes this car touchscreen DVD + multimedia player perfect either for the resale market, OEM market, or personal/company use. As always, it is available direct to you from the original source for wholesale direct from China electronic products, Chinavasion. Has a wonderful Bluetooth connection manager. Give yourself peace of mind by being able to make easy handsfree calls through your new multimedia system. its a fantastic machine, the TFT its great so and the dvb-t .